“Willkommen, ein neuer Tag beginnt… Wach auf! 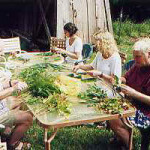 For five days in early November, Pu`u Hinahina cabin went international. 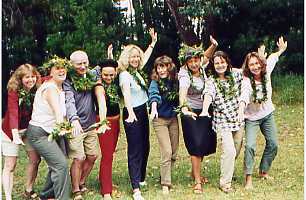 A group of German lomilomi students (and one lomilomied spouse!) studied hula, native plants, and Hawaiian forest lore with Roselle. 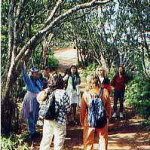 Arriving at Koke`e after a workshop with Penny Prior, and having already seen some of Kaua`i’s sights (including Eo e Emmalani i Alaka`i on 12 Ocotber), the group was relaxed and eager to learn more about things Hawaiian. They went to the right place. Days went by all too fast, in the excitement of new words, new concepts, new skills. In the evenings, students listened to talks by experts like David Boynton and Marsha Erickson, or watched videos about native Hawaiian birds, astronomy and cultural practices. During interludes, halau members sang and danced for informal entertainment. On the last evening, however, when electricity failed in Koke`e, and no guest lecturer was on the schedule, it was the Germans’ turn to teach. Despite never having sung together before, they performed their own traditional songs in lovely multi-part harmony until late into the night. Several of them remarked that many modern German performers do not represent their own traditions of song and dance very well. 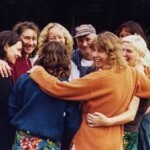 Often they do not take the trouble to learn correct ways of dancing or singing folk music. Certain families have preserved the true musical traditions, but in many cases they do not perform publicly. Certain po`e hula can understand this problem! All too soon, it was over. After hugs, tears, speeches, songs, and a final pule, everyone came down from the mountain physically and mentally. All of us who had the privilege of meeting the German students wish them well, and hope to see them back on Kaua`i again. Many people besides those already mentioned deserve thanks for their help with this event: Caela the cook, Barb the woman of all work, Birgitta and Sharee the chauffers, Pat the prime mover, Andrea and Penny the co-coordinators, and David for keeping us all on the right track. Plenty mahalo and aloha to you all. 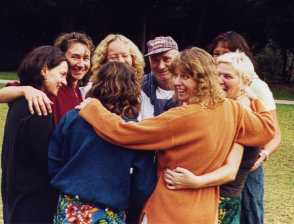 A group hug before the students perform for a special audience, Hui O Laka’s Marsha Erickson. 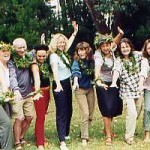 Ho`ike: Showing off their new skills, the German students and Kaua`i’s own Penny Prior dance on their last day in Koke`e. 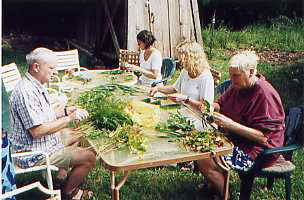 Getting ready for their Ho`ike, students make lei from plants they gathered in the forest. 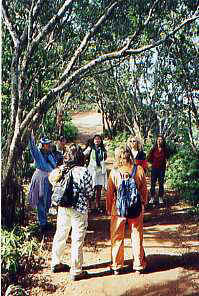 On a hike down Pihea Trail, Roselle shows one of the many native Hawaiian plants. Food for the Body is as important as food for the soul. 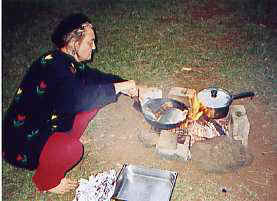 Caela, the ever resourceful cook, grills salmon for the final dinner. When Koke`e’s power went down, disabling the cabin’s electric stove, she improvised with an old refrigerator grate.